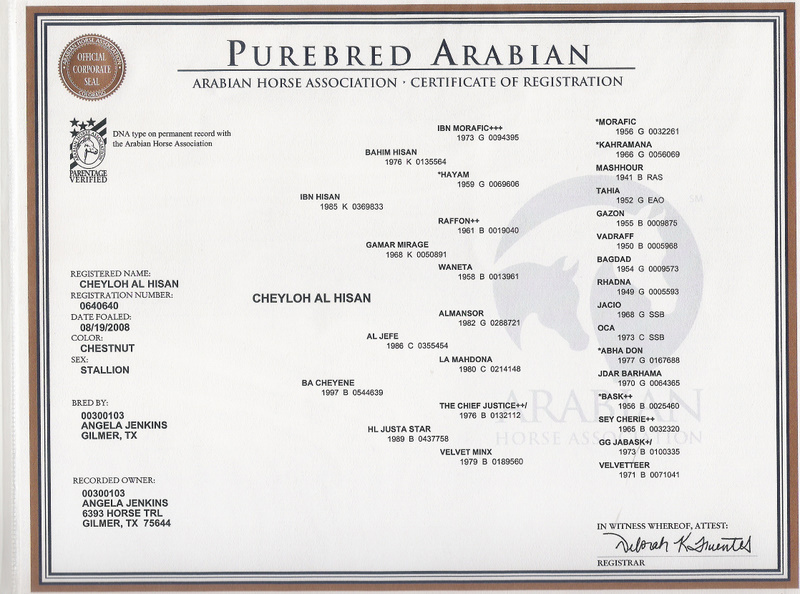 Cheyloh al Hisan (Ibn Hisan x BA Cheyene) -- flaxen chestnut with chrome. Beautiful, flashy, lovable & wants to be your best friend forever. Loaded with potential for all around family fun, whether it be Class A sport horse, pleasure classes, trail riding, just ambling around in the pasture or going to local fun shows. His dam was my favorite pleasure riding horse, & Cheyloh can be your favorite, too. Cute face with gorgeous, huge Spanish eyes ... I'm told he looks "just like" his famous grandsire, the pure Spanish halter & Western Champion, Al Jefe. Could do Western, hunter, dressage, ACTHA or other competitive trail or endurance ... you name it. This is a big, sweet athletic gelding that you will love for a lifetime.